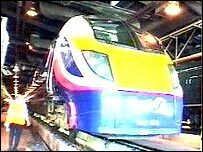 BBC NEWS | Programmes | Politics Show | South West: Life after Beeching? Three South West railway lines are under threat of closure. Two were reprieved from the "Beeching axe" of the 1960's. But a new initiative might save the day. Government and the Strategic Railway Authority (SRA) have launched the initiative at seven locations throughout England and may increase it to 56 if the scheme proves successful. Together with local rail partnerships, communities are urged to market their local branch lines to see if there really is enough demand to keep them open. The local lines involved are Gunnislake to Plymouth, Liskeard to Looe and St Erth to St Ives. The latter were recommended for closure by Dr Beeching 40 years ago when he axed the branch network. The then Transport Secretary, Barbara Castle, intervened personally calling Beeching's plans "slaughter of the innocents". Mrs Castle ensured that two Cornish lines remained operational, describing the St Erth to St Ives as the most beautiful coastal journey in the country. Andrew Griffiths, Wessex Trains' business manager for Devon and Cornwall, admits that the rolling stock used on the St Ives line desperately needs replacing. Most of the passenger coaches are nearly 20 years old. But Mr Griffiths supports retention of the line claiming that, with better marketing and more community involvement, the line has a crucial role to play. And there is local support too. Jeremy Joslin who chairs the Hayle Chamber of Commerce also heads a group of local businessmen who want to run a micro franchise. They would run a local bus service to link up with the trains, and offer a more frequent rail service to help ease the traffic congestion in St Ives in the summer. Local MP, Adrian George, the Liberal Democrat member for St Ives, says the line is badly treated by the railway operators, offering what he called a fag end service. Mr George is urging the government to back local branch lines, contradicting the "use it or lose it" philosophy emanating from the Department of Transport. Let us know what you think. That is the Politics Show, Sunday, 28 November, 2004 at 12.30pm.